Casino Camper - Review for Morongo Casino, Resort, Spa, RV Parking Area Has Moved. RV Parking Area Has Moved. The designated RV Parking area has moved. It's no longer behind the casino in area G. The new RV Parking area is further away from the casino on a hill behind the bowling alley and bingo hall (the old casino). A shuttle is available to the casino. 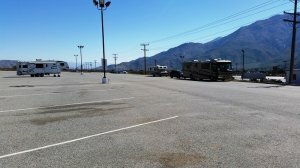 Large, paved parking lot just for RV's (semi trucks have their own area). This lot is well marked - just follow the signs. The new casino is very nice and huge (tall). However, the slots didn't want to give is anything for our efforts.